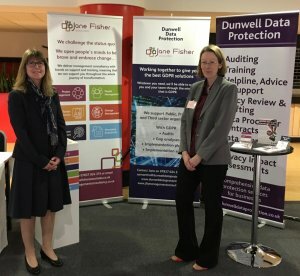 Jane Fisher and associate Sam Dunwell, were delighted to be one of the sponsors of the University of Salford Manchester GDPR in the Private Sector conference, held at Old Trafford in Manchester on 24th January. The day included advice and guidance from a range of exhibitors like ourselves, as well as keynote addresses and workshops to help raise awareness of GDPR, and provide ideas on strategies to help businesses get ready for 25th May 2018 – when GDPR will be a legal requirement. The sessions considered digital marketing to customer loyalty schemes; how to protect a company from the threat of data breaches and making sure IT systems met the latest regulations. A great day was had by all – including us! Remember … whether you are a solo-entrepreneur, an SME or a business employing 250+ staff; whether you are from the private, public or voluntary sector – you cannot escape GDPR! 24th May 2018 is your deadline to be ready, as the 25th is when GDPR becomes directly applicable and failure to comply will leave your organsiation open to enforcement action with heavy fines and a damaged public reputation. For further details of our GDPR workshops, please visit our Events page.